LinkedIn is the quiet social network. It has over 160 million members, about half them in the United States. But you don't read about LinkedIn members posting embarrassing photos, or bragging about their crimes, or soliciting minors. That's because LinkedIn is all business, all the time. Founded in 2002, LinkedIn is designed for professional networking. Its profiles are basically resumes. The connections that members form are based primarily upon business and career interests. Through LinkedIn, you can build and work a network of people with whom you once worked, even if you didn't realize you worked for the same company. You can find contacts within potential employers, hiring managers, and people who might recommend you for a job. You can pick up freelance work, too. You can also join groups of people who share your professional interests, asking questions and getting answers. Where do you get at least 50 connections? You can start by searching for people you know by their names. Also, LinkedIn will try to find connections for you, locating people who match your industry, postal code, employers, schools, etc. 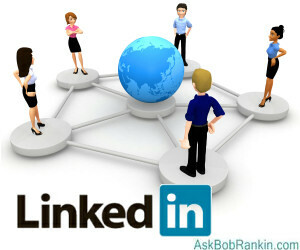 You can also upload your contacts to LinkedIn, which will send requests to connect with you to your entire address book. Note that in order to do this, you'll have to cough up the password to your webmail account. Of course LinkedIn promises they won't poke around while they're in your Gmail, Hotmail or Yahoo account, sucking out your contact list, but still it seems a little icky to me. And do you really want to invite ALL of your email contacts to join you on LinkedIn? An alternative that makes me more comfortable is to go through my contacts manually, then paste in a list for LinkedIn to invite. If you're okay with the automatic "invite all my contacts" method, at least change your password afterwards. Your immediate connections have connections of their own, and you can search those second-level connections for people you would like to know professionally. Be careful about approaching strangers with connection requests, though. If too many members say, "I don't know this person" or "this is spam," you can be banned from LinkedIn. Companies have profiles on LinkedIn, too. You can connect to a company page to receive press releases, job postings, and other information about the companies. There are over a million "groups" on LinkedIn where you can find people who share your career and business interests. About one-third of these groups are open to anyone, while the rest require vetting by a moderator before you can be admitted. Job listings can be searched on LinkedIn, and many employers encourage applicants to apply by clicking a button that submits their LinkedIn profiles. You can search for jobs by location, industry, job title, salary, and other criteria. A well-developed LinkedIn profile is an important job-hunting and professional networking tool whether you are a seasoned executive or a recent college grad. In order to get the most out of LinkedIn, it's important to stay active in your network. Keep your credentials up to date, occasionally post an interesting link or blog post, or answer another member's question. And check out Inc Magazine's list of 7 Things You're Doing Wrong on LinkedIn to hone your networking skills even further. Most recent comments on "Are You Linked In?" I use LinkedIn to find contacts at companies I want to do business with. You can also create your own "Group" for free on LinkeIn on any topic you want. I created a group for alumni from my high school. It's always good to help out a fellow alum whose looking for a job. Enjoy and invite me to connect. You'll find my e-mail address in my profile on LinkedIn. I'm the Mark Madere who is the Photographer | Internet and Social Media Marketing Strategist. Be sure to include in your connection request that you saw this post on "Ask Bob Rankin." If you don't - I will NOT accept your request because I won't know why you're inviting me to connect. Yes as you mention Linkedin can be beneficial however you did not mention how to eliminate those pesky emails from Linkedin that one does not want/need nor care for. I joined LinkedIn at the invitation of my nephew who retired from the Navy early this year. I pretty much ignore it because I will be 73 soon and manage my wife's janitorial company. (Think really small. All my hiring is contract labor and not much of that.) For folks looking and mobile, it appears to be a good network. Downside to LinkedIn: Unless you are *extremely* careful, your entire contact list/s can be hijacked by LinkedIn and become the target of a marketing blitz. I was trying simply to support a friend with a new business by agreeing to a mutual link, when something I did (never did figure out what) gave LinkedIn access not only to my personal and business contact lists, but also to that of a client organization whose email list was temporarily on my computer. Talk about embarrassing! Complaints were still flooding my inbox months later. My experience is not unique, as I later discovered many such stories online. So, yes, LinkedIn can be helpful. It can also be a major spammer. Be VERY careful! I subscribed with minimal info how do I unsubscribe? ia it like facebook once they have you they HAVE you?? In a weak moment I signed up with Linked In. So far I have done NO editing of my profile. How do I get unlinked? I was a little hesitant about Linked In for quite a while. Then a geologist friend of mine here in Calgary was offered a job in Saudi because of his Linked In connection. He went through a series of interviews and they flew him and his wife down to Houston for a final interview. They jumped through all the hoops that they had to, but at the last minute they were declined. But it could have gone the other way; the fact that somebody in Saudi or Houston saw their Linked In connection and made them the offer in the first place was enough to convince me that anything is possible and I should get more involved with Linked In. And I have. And no, I haven't had any offers...yet. And another thing, when I sent my last email, I realized Bob Rankin headed Linked In. I had subscribed to his TOURBUS for at least a decade, and now subscribe to his daily "askbobrankin" and I have always found him to be knowledgeable and trustworthy and willing to help. Thanks, Bob, for the years of TOURBUS and your current newsletter. I stay away from Linked In. It has been said that it is an Obama created website to further his propaganda and lies to the good people of the U.S.A.
EDITOR'S NOTE: That must be pretty strong kool-aid you got there... As I said, LinkedIn was created in 2002. Obama began his presidential term in 2009.